United We Flourish – Ellen Hutson with Concord & 9th! Home / Blog / United We Flourish – Ellen Hutson with Concord & 9th! Hello! I’m honored today to be a part of the United We Flourish Release Blog Hop from Ellen Hutson in collaboration with Concord & 9th! 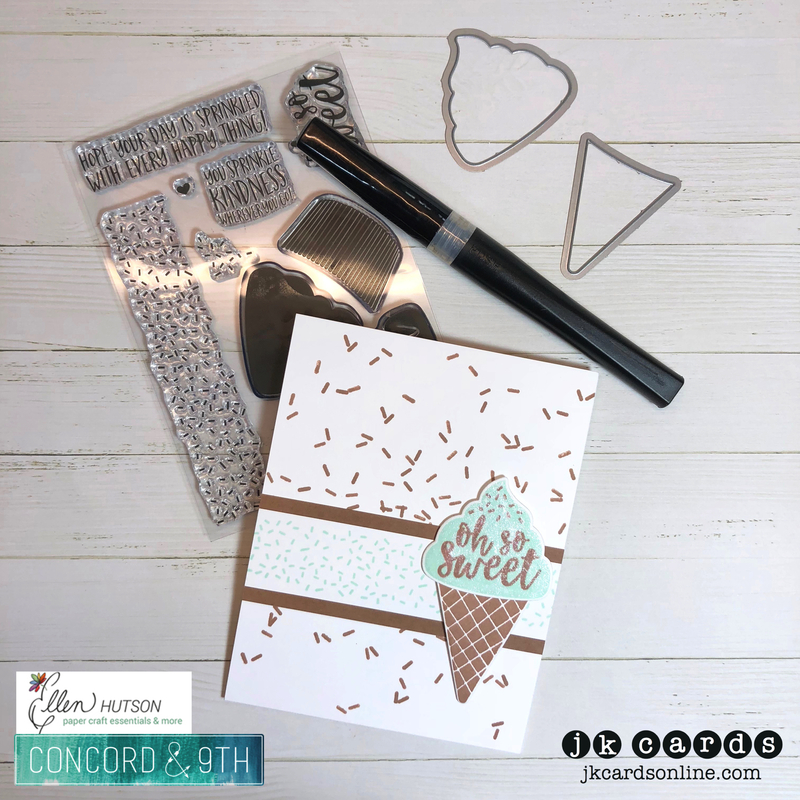 These stamps and dies are designed by Concord & 9th and are available exclusively from Ellen Hutson! 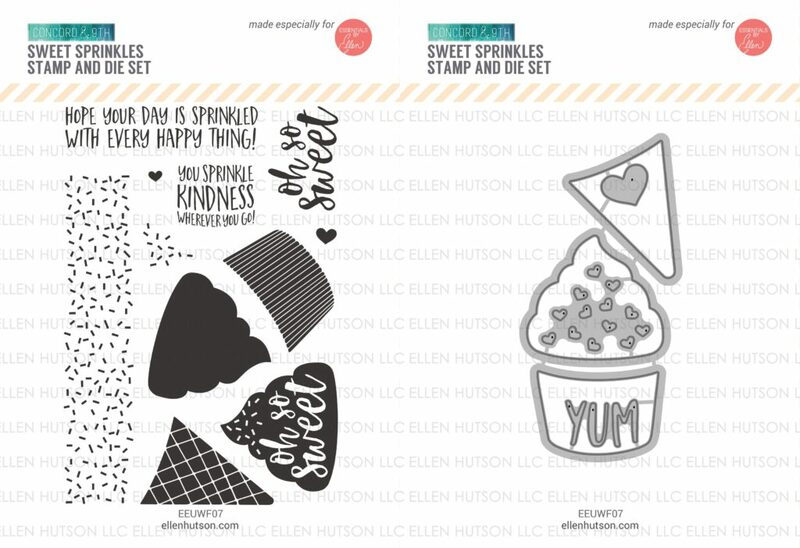 The set is called Sweet Sprinkles and is a fantastic set for making cards for all sorts cards for different occasions! I paired the set with another great one from Concord & 9th, the Sprinkles Turnabout. To celebrate this gun release, two randomly selected commenters will win a $30 gift certificate to the Ellen Hutson shop and two commenters will win a $30 gift certificate to the Concord & 9th shop. To enter just leave a comment on the Ellen Hutson Classroom blog and the Concord & 9th blog by 12pm PST on December 26th. This entry was posted in Blog, Card Class, Concord & 9th, Crafts, Ellen Hutson, Embossing, Lawn Fawn, Photopolymer, Stamps and tagged Card Making, Concord & 9th, Crafts, Ellen Hutson, Lawn Fawn. Bookmark the permalink. Kind Hearts – Concord & 9th Guest Designer for Feature Friday! SIP Challenge 131 – Emboss It! Cute card, Justin. I love ice cream. Hope you’re having a great weekend and staying warm. I’m tired of getting snow every few days. I hope Mother Nature stops this foolishness and send warmer weather soon. Have a great week. Fun card! I haven’t tried any turnaround stamps yet, but I’m intrigued. It’s a winner with me….. Love mint ice cream. Nicely done and Happy Holidays! Sprinkles on top of sprinkles – genius! Love the colors , design chosen to create this Sweet Sprinkles Creative Work of Art. Super sweet card, love the sprinkles background and the ice cream cone, yum! I so love this set! And your creation. Such a cute card, Loving this release! Fun and sweet, especially love the soft tone! Cute. I like the mint ice cream. I think this stamp and die set are adorable and could be used for all types of celebrations. Your card design is darling. I loved that you used two colors on the cone so it appears to have texture. Thanks for sharing. Adorable die and stamp set. Love how you used it for the background and ice cream on your card design. Can’t wait to get this set myself. Nicely done. Isn’t it fun when the ink is the perfect color name!!! (Kind of unfortunate about the cone, though!!!) Love the card. It’s well balanced. (Which is maybe not the best way to say what I am trying to say, but my brain is still caffeine deprived) Thank you. This is a lovely card! “Oh so sweet” a card!! I love brown and blue together. Pingback: United We Flourish- Ellen Hutson featuring Concord and 9th! Love the card- who doesn’t like mint ice cream? What a good idea to combine the set w/ C9 turnabout. Looks perfect! Beautiful! I love the muted colour palette used and the sprinkles. Love your card. Mint chip is my favorite ice cream.